Supreme Court 2015: King v. Burwell was never that much of a threat to Obamacare. Maybe King v. Burwell was never as big of a deal as we all thought. 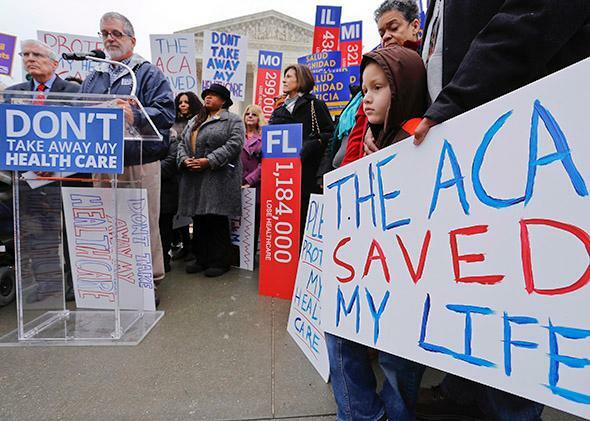 Obamacare supporters demonstrate at the Supreme Court in Washington on March 4, 2015. Two rather substantial surprises coming out of the high court on Thursday morning—the Texas housing case comes out 5–4 in favor of the idea that disparate impact claims are cognizable under the Fair Housing Act. The other one, the big one, is of course King v. Burwell, the hugely anticipated challenge to the Affordable Care Act. By a 6–3 margin, in an opinion authored by Chief Justice John Roberts and joined by Justice Anthony Kennedy and the court’s liberal wing, the court finds that the act’s tax credits are available in states that have the federal exchange rather than merely in states that created state exchanges. As Walter notes, this is a huge win for the Obama administration and the solicitor general’s office, and I find myself idly wondering if this case was ever as big a deal as we all believed it to be. I’m not suggesting that the threat to the ACA wasn’t real. Just that this challenge never quite seemed as much of a clear and present danger as Obamacare faced in 2012. For one thing, as Stephanie Mencimer recently suggested, the business community was aligned against the challengers this time. For another, the court seemed genuinely aware of the implications of siding with the plaintiffs. But I was also struck at the time of oral argument by the chief justice’s decision not to broadcast same-day oral arguments and to ask almost no questions himself. Even the decision to release this opinion with several more days in the term strikes me as Roberts signaling that this case was never quite the droid we were looking for. In a democracy, the power to make the law rests with those chosen by the people. Our role is more confined—“to say what the law is.” That is easier in some cases than in others. But in every case we must respect the role of the Legislature, and take care not to undo what it has done. A fair reading of legislation demands a fair understanding of the legislative plan. Congress passed the Affordable Care Act to improve health insurance markets, not to destroy them. If at all possible, we must interpret the Act in a way that is consistent with the former, and avoids the latter. Only an hour after the decision came down, it feels somehow inevitable that Roberts would have decided it this way. But maybe there was always good reason to believe he planned to just do a nuts-and-bolts read of the statute and its purposes all along. And that may be what’s aggravating Justice Antonin Scalia and the dissenters most of all. See all of Slate’s end-of-term coverage.